Liam Walsh, aged 26, appeared at Dublin District Court charged under the Theft and Fraud Act. The damaged Lidl store at Fortunestown. A FATHER-OF-one has been refused bail after he was charged with handling €1,400 of stolen goods taken during looting at a supermarket in Dublin. During last week’s snowstorm, the Lidl at Fortunesown Lane in Tallaght was extensively damaged after it was raided and looted while another shop was broken into, on Friday night. Liam Walsh, aged 26, from Ard Mor Drive, Tallaght, appeared at Dublin District Court today charged under the Theft and Fraud Act. Walsh, who is accused of handling stolen property taken from the Lidl supermarket, made no reply when charged, Garda Stephen Murray told Judge Grainne O’Neill. 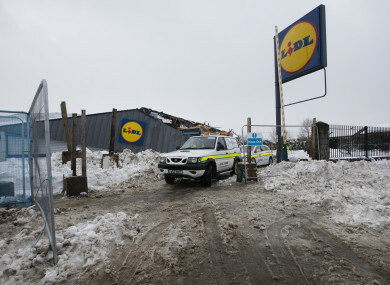 Objecting to bail due to the seriousness of the offence, Garda Murray told the court that on 2 March the Lidl supermarket was burgled and “extensive damage was caused by a large excavator”. Numerous video appeared on social media showing the building collapse, he said. Gardaí learned that perishable as well as electrical goods were stored in the back bedroom and in the kitchen of Walsh’s home, it was alleged. A search warrant was obtained resulting in the goods being recovered, the court heard. They were found in several black sacks and pictures of goods had been circulated by phone, Garda Murray said. The court heard that Walsh, who is unemployed, lived at the house with his partner and their child and was arrested yesterday and detained for five hours before he was charged. Garda Murray said that he expected that given the circumstances the case would go to the circuit court. He also cited fears that if bailed the accused would not answer the charge which can result in a sentence of up to 10 years. The garda said it was his belief the accused intended to sell the stolen goods. Defence solicitor Michael French suggested that given the value of the goods it was more likely that the case would remain in the district court. He submitted that other people had access to the house. Walsh denied the charge, his solicitor said. French asked the garda if Walsh’s fingerprints or samples of his DNA had been found on the items. The garda replied that the accused had said that they could be found on the items as he may have picked them up. Swabs had been taken from him but analysis had not yet been carried out, the court also heard. Asked if a phone was seized from the accused, the garda said Walsh told him he did not own a mobile phone. French said his client could be trusted to turn up for his trial and that there had been a “media furore” about the incidents. Pleading for bail, he argued that the charge had been brought prematurely and the investigation was still ongoing. Other people still had to be interviewed and the evidence was circumstantial, he submitted. Judge O’Neill said the accused still enjoyed the right presumption of innocence. However, she refused bail and remanded Walsh, who did not address the court, in custody to appear at Cloverhill District Court on 13 March next for directions from the Director of Public Prosecutions to be obtained. Legal aid was granted. On Saturday nine other men appeared at the district court and faced a range of charges in connection with the raiding and looting at the Lidl and a break-in at a nearby Centra shop. Six were released on bail while the remaining three were remanded in custody. Email “Man refused bail after being charged with handling €1,400 stolen goods during alleged Lidl looting”. Feedback on “Man refused bail after being charged with handling €1,400 stolen goods during alleged Lidl looting”.